The fundamental aesthetic of Milano fashion maestro Giorgio Armani has always been a form of stratospheric normalcy; an elegance and simplicity that most of us mere mortals could never even hope – or in my case, want – to achieve, with its unfussed, seamless drapery and cut; its perfection; its conservatism. Look at any Armani show in the haute couture season, and he is invariably the least daring creator, particularly when compared to the more ‘out there’ designers of France, the UK, or Japan who seem often, to push the boundaries of weirdity and alien unwearability to fiercely artistic, but sometimes unintentionally comic, effect. The thing about Armani is that his clothes, even at the very top of his range, are always, ultimately, wearable. And the same thing can be said for his perfumes. While La Femme Bleue – which I have never smelled but have some kind of weird crush on, having read gorgeous reviews by The Non Blonde and Olfactoria about its oneiric, black-irised, cacao-lunared shimmeringness – does seem to warrant the extreme lust that a limited edition can inspire (1000 bottles worldwide, and Birgit somehow got her elegant, Viennese hands on one), (editor’s note, I now have some in my collection and you can search for the review on here ), the new perfume in the iris-themed Couture Collection, Nuances, is also rather nice, also a limited edition of 1000, and will convicingly accompany any extravagantly priced Armani creation with its taut but ‘romantic’ urbanity, its airtight, rounded tastefulness (the perfume was conceptualized around a particular metallic grey organza the company has created for one of its recent shows, and this ‘material’ effect does somehow come through in the perfume’s exorbitantly careful execution). It is, however, as others have also noted, nothing new. In fact, on first application last night, the perfume was so resonantly familiar that the excited anticipation of a perfume that might be strange, enigmatic, perhaps austere, a quality I usually associate with iris, quickly wilted into a more shrew-eyed examination of what it was exactly that the much more standardized, formulaic perfume in the vial reminded me of. And it is this: Prada Infusion D’Iris, which I like and consider one of the best mainstream commercial releases of recent years for its integrity, the sense that it smells like a perfume for once, with its own identity, balance, and lovely, endearing smell. It is also a perfume I find, on occasion, quite annoying somehow, with its wrapped-and-ribboned fashion perfection, a delicate and lovely scent that nevertheless leaves no room to breathe. If you know the Prada, then you will be immediately able to imagine Nuances, which takes that same benzoin and bergamot-infused, sweet, powdery iris accord, and places it neatly over (an again, familiar) modern, niche-level vetiver, the kind of vetiver found in anything from Vetyverio to Vetiver Extraordinaire; that refined, insistent, unearthy, but loveable and woody twenty-first century-vetiver we kneau so well, wedded convincingly to a high-quality sandalwood and heliotrope accord that allows the scent to persist for quite a long time on the skin as the iris, or orris root – not as pronounced as you might like or expect – encircles the blend; breathing a summoning, balancing gentility into the whole. And there you have it. This is the kind of perfume that is very likely to draw compliments when the person who can afford to buy it (500 euros) walks into the room, as it is so accessible, pleasant, even charismatic. There is a cinnamon-woody richness there in the base that for a few fleeting seconds was reminiscent for me of vintage Feminité Du Bois extrait, and this warmer aspect, and the decent quality of the ingredients elevates the scent above the more commercial (and ten times cheaper) Prada with an almost incensey richness that is quite pleasurable; even if the perfume overall lacks anything, ultimately, that could make me swoon. That ‘elevation’, though, is what this line is all about: and though Nuances is not what I would call special, it is certainly a well-crafted iris-vetiver (more a vetiver) that will not for a moment, I think, let down its chic, moneyed, and immaculately tech- fabric attired wearer. Totally OT (off-topic), Dubaiscents is one of the loveliest, sweetest, warmest and kindest perfumista imaginable! She was responsible for my sample, too. So generous! It is shame that it will probably take me so long to reciprocate, but I was thrilled with the pack that came yesterday. As for the suffocating refinement, I couldn’t agree more. It is still a kind of nice smell, though. You guys make me blush! Even if you both had different responses to this than I did I always appreciate reading the expert opinions. :-). I hope you enjoy the rest of the package even more! Interestingly, I have not the slightest curiosity about this. I will, however, try the Prada because it is affordable and obtainable. Several times this year, I have enjoyed Prada Candy, and felt like I was betraying my Yatagan loving heart. I shall test the Prada Iris the next time I am at Nordstroms. How strange to see such differing perfumes mentioned in the same breath. Welcome back. You’ve been missed. Now don’t do it again. The prada Iris is a great after bath, just before lights-out scent. I don’t find it “enough” for venturing into the world. caron’s vintage Poivre was a great favorite until it became almost impossible, even at the Caron boutiques. A sharp,old gal at the flagship told me “Wear Yatagan. It’s Poivre without the flowers. You can tuck anything you want under it and wear it as a bolster like a handsome brooch.” Haven’t been without a bottle since. I love Yatagan as well: arid, but loving. As they say, Go Big or Go Home! I love this blog! Go Big or Go Home, indeed! So my taste in fragrance is a bit schizophrenic! So! Oh this sounds so lovely! I agree about Infusion d’Iris also. It’s nice, certainly, but SPECTACULARLY overpriced for what it is. At only 1000 bottles, I doubt that I will be smelling this one anytime soon. That being said, for the price and the exclusiveness, I would have expected spectacular. Your analysis of Armani aesthetics is mind-blowingly on target. I admire Armani, but it’s all rather prescribed and over perfect at times. What is your own take? I am so glad that I have the less expensive Infusion d’Iris, as 500 euros seems rather pricey for something so ‘meh’. And I only WISH Armani’s clothes were ‘wearable’ !!! I visit the boutique sometimes in hopes that he will finally make something for someone 6 feet tall. Not one item even came close to fitting. But, that is pretty standard when I go shopping. I haven’t ventured far into iris perfume territory, and I don’t know Armani perfumes. The two I’ve tried are Iris Silver Mist and Iris Nazarena. Of the two, I like Iris Silver Mist because of its dry, rooty carrot aspect. It’s interesting. But, I don’t really get it. Too cerebral for me. Actually I’m sniffing both right now – they’re very dry. Maybe iris is better in a warm, humid climate. If the two I’ve mentioned are representative of all iris perfumes, then probably that category is not for me. I like perfume to embrace me somehow. Any suggestions? That one is not very high on my “to try” list but I so enjoy reading your elegant prose and looking at the photos. 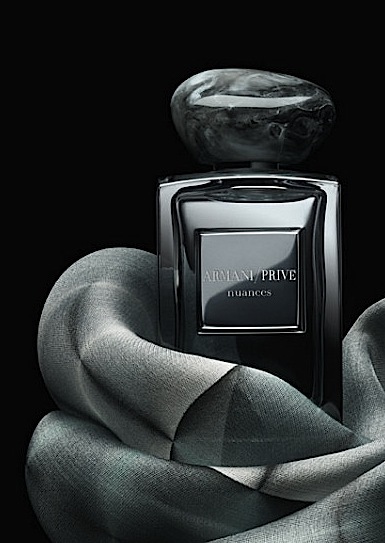 The Armani Prive bottles are certainly lovely. I was looking at them in Neiman Marcus dept. store in Florida, but I didn’t lust after them. Hmm. Doesn’t sound much like this woman, I’m afraid. The Prada is well-done for a moderately-priced mainstream composition: impressive for that when it was released, and more so now relative what is new these days. For iris-vetiver I think I’ll still with N°19, which is that appealing duo and so much more. For some reason, that name is off-putting. Nuances. It sounds kind of cheesy. And cheap. Like a drugstore body spray or personal lube. Eek! I should really check for mistakes before I blithely click Post!